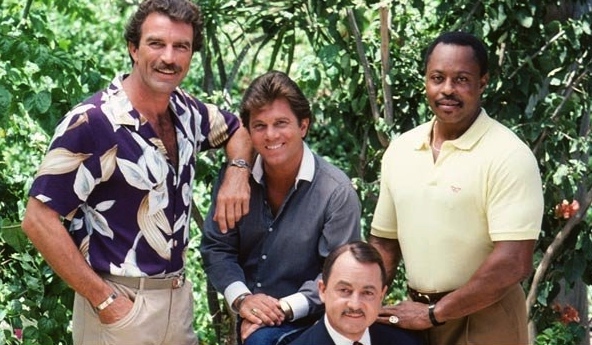 The cast of CBS’ “Magnum P.I.” reboot (from left): Stephen Hill as Theodore “TC” Calvin; Zachary Knighton as Orville “Rick” Wright; Jay Hernandez as Thomas Magnum; Perdita Weeks as Juliett Higgins. Los Angeles-based Media Action Network for Asian Americans (MANAA) released the following statement on Sept. 13. MANAA is condemning the upcoming reboot of “Magnum P.I.” — which debuts Sept. 24 — for leaving out Asian/Pacific Islander regulars just like the ’80s original. Ever since CBS rebooted “Hawaii Five-O” in 2010, MANAA spent countless hours in research and conversations with the network about the offensive way executive producer Peter Lenkov cast Asian/Pacific Islander guest stars mostly as suspects and villains. In its eight seasons (193 episodes), every guest star who tags along with the team to catch the bad guy has been either white or black — except ONCE when she was Asian. On Dec. 3, 2017, after CBS bought a pilot script from Lenkov to reboot “Magnum P.I.,” MANAA President Rob Chan wrote a letter to CBS President Kelly Kahl and Senior Executive VP of Programming Thom Sherman (and cc’d the heads of casting and diversity) demanding that Lenkov be fired (knowing the original series was infamous for not including any API regulars, he would feel even less obligation to include them in significant ways), that the potential series star an API (in the history of television, no series set in Hawaii has ever starred one), and that the majority of the cast be API (to reflect reality: they make up 60% of the 50th state’s population). Kahl didn’t respond. Instead, he greenlit “Magnum P.I.” to become a series in the fall starring Mexican American Jay Hernandez with no APIs in its cast (Tim Kang was added in July). Of Lenkov’s pattern with “Five-O,” Chan wrote: “Beyond casting APIs as Chin Ho Kelly and Kono Kalakaua — characters first established as such in the original 1968-1980 series — he assigned the role of Max Bergman to Masi Oka. However, each succeeding regular Lenkov added were non-APIs: a Caucasian woman, an African American man, and a Latino man. He also kept adding new unofficial Caucasian regulars (Lauren German and Larisa Oleynik), who often got more screen time than the API regulars. Chan’s letter continued: “It was only after a conference call in the summer of 2015 with [the head of diversity]and a current programs executive that Guy says he began to see some changes in early 2016. “Still, at the most recent APAMC meeting with CBS, we relayed Guy’s experience of talking to a guest API actor who was told by the driver taking her to the set that he was used to driving in blonde extras from the airport. Extras who didn’t speak. It seemed evident that Lenkov didn’t feel Hawaii looked Caucasian enough. The original “Magnum P.I.” (1980-1988) starred (from left) Tom Selleck as Magnum, Larry Manetti as Rick, John Hillerman as Higgins, and Roger E. Mosley as TC. In the 2017-2018 season, those three regulars did not appear in most episodes. And when they did, they averaged less than two minutes screen time. The nephew of Danno (Scott Caan) was seen more. Given this history, MANAA is skeptical as to how much Tim Kang’s character will appear on “Magnum.” In fact, in the show’s latest promo, star Hernandez introduces the four regular characters and doesn’t even mention Kang’s role. The press and public have largely perceived CBS as being behind the times and not reflecting the diversity of this country. In the 2016-2017 season, the network aired seven new series starring seven white men, and in the 2017-2018 season, seven new series starring six white men. Maybe that’s because — as was pointed out at last year’s Television Critics Association (TCA) summer press tour — everyone in CBS’ casting offices in Los Angeles and New York was white. That was rectified only in January with the hiring of a Latino executive.